Buxton fell to a narrow defeat in their second friendly outing of the summer on Tuesday night. Martin McIntosh’s side were undone thanks to Damian Reeves’ strike midway through the second half. Reeves’ header came after a pinpoint cross from James Lawrie to settle the contest. The goal came at a time when the Bucks were enjoying a good spell of possession. McIntosh started with eight players who began Saturday’s 1-1 draw against Chesterfield. Trialists Ben Hutchinson and Jonathan Williams were given starts, whilst Alastair Taylor also began. 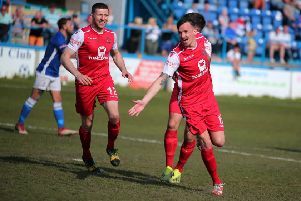 Taylor had a loan spell at Buxton last season but has since been released by Alfreton. Goalkeeper Adam Reid and Alex Byrne continued for the Bucks, whilst quartet Shaun Tuton, Josh Davies, Stuart Ludlam and Mark Reed all sat out. Bucks: Reid, Byrne, Green, Palmer, Young, Istead, Taylor, Hutchinson, King, Williams, Hardy. Altrincham: Parton, Brown, Griffin, Moult, Leather, Williams, Richman, Wilkinson, Perry, Crowther, Clee.